Growing up, every Sunday after church equaled a trip to a restaurant with friends and family. I remember growing terribly antsy waiting around for the food, so I would unfold my napkin, borrow my dad's pen, and draw as many puppies as I could think of! Yes, I was 7 and obsessed with 101 Dalmatians, so you don't even want to know how many variations of spotted dogs I came up with! Oh how I wish my mom had kept all of those napkins.. In a revived passion for doodling pups, I thought that I would share a quick sketch with you that I drew recently. 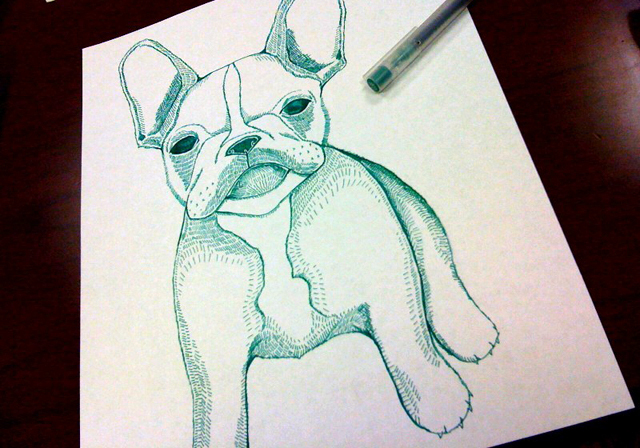 It is a french bulldog. I think she is rather cute! It is a bit more "formal" than I usually draw, but I like it! Thinking of offering some custom pet portraits? Trying to think of how to make these more special than just a pen and ink drawing..... sigh! What do you think about offering custom pet portraits?